Camping trailers are a common sight – mobile tiny houses are still a bit of a novelty. Some of the aesthetic differences are immediately recognizable but then the similarities begin to blur. Below is a quick run down of how these two housing choices compare & contrast. Construction: Manufactured to RV industry standards in a factory setting. Typically built with a thin shell of metal, wood, and composites. The base trailer is usually custom engineered for the home it supports. Plumbing: Built with standard RV toilets, plumbing, water, and waste tanks. Electricity: Typically built to connect to grid power with standardized plugs & outlets and use on-board backup generators. Can also be built with off-grid systems. Weight & Portability: Relatively lightweight and easy to tow. Size: Camping trailers are often shorter (in height) than tiny houses. The maximum road height for most (if not all) U.S. States is 13 1/2 feet (without special permits). You may find some 5th wheel trailers coming close to this height, but not your average trailer. This makes camping trailers easier to pull into gas stations and other tight places. Insurance: Relatively easy to insure. Financing: Lenders understand RVs well and many financing options are available. Warranty: Like many manufactured products warranties are often available. Taxes: Generally recognized as a second home (but check with a tax advisor). Immediacy: The moment you take possession of a camping trailer it’s usually fully functional and ready roll – the benefit of buying a turn-key manufactured product. Cost: Used camping trailers can be found on craigslist, curbsides, and through dealers – often for very little money. In fact in terms of bang for your buck, used (and even some new) camping trailers can be a good deal. Fit & Finish: The interiors of manufactured homes are typically finished off tastefully and carefully. But like most manufactured products long term reliability and longevity will vary. Year-Round Living: Lighter weight frames and siding also mean that trailer homes will cost more to heat and cool. Construction: Handmade, typically by owner-builders in backyards and driveways. Built like a normal framed house on a heavy duty flatbed trailer. Plumbing: Can be built with RV plumbing but owners often choose to install composting toilets, gray water outlets, and garden hose inputs. From time to time you’ll even see some rain water collection systems being used. Electricity: Can be built to connect to grid power or built with an independent off-grid system. Weight & Portability: Typically heavier than camping trailers making it more costly and difficult to tow. Size: While the side walls of a tiny house are shorter than most normalhomes, a 12/12 pitched roof can easily cause the total height of the house to come to just under 13 1/2 feet. The side eaves also often extend the house to a full width just under 8 1/2 feet (the road limit for trailers). So while tiny houses are tiny for houses – they are in fact very large trailers (watch those overhangs). Insurance: Sometimes easy to insure – depending on your local insurance agent and their ability to imagine how tiny houses fit into existing definitions. Financing: Rarely financed and somewhat difficult to finance because lenders are typically unfamiliar with tiny houses – making them difficult to underwrite. Warranty: When you build something yourself – you are the warranty. Taxes: Generally not recognized as a second home (but check with a tax advisor). Immediacy: Months after buying your flatbed trailer you might have a habitable home if you’ve worked hard long days or had lots of help. Building your own home often comes with the cost of investing real sweat equity. The smaller the project the faster it goes but tiny houses take time to build. Cost: I’ve seen tiny house owner-builders report spending anywhere between $5,000 and $50,000 to build their home. Labor costs can be offset by doing a lot of the work yourself. Materials costs can be cut by making frugal choices. Fit & Finish: It’s up to you to choose what kind of custom finish your put into your home – and the quality of the work. Many tiny houses are finished off with a lot of natural wood but anything you can imagine is possible if it’s in the budget. 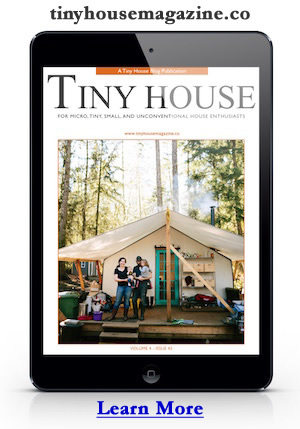 Year-Round Living: Many tiny house homeowners live year-round in their homes. They are built like real houses with materials that typically do a much better job of keeping the weather outside. When you boil it down camping trailers are better for those who need more mobility and are content with giving up comfortable year-round living and some aesthetics. Tiny houses are better for those who intend to mostly stay put, need the year-round comfort from the weather, and want a custom home. Both solutions can help you find a way to live more simply, untethered from some building restrictions in the gray area between rentals and normal homes. Lastly, they can also both provide a safe, mortgage-free home to those needing or wanting to downsize their lives. In questionable economic times having the added security of owning one’s own home – no matter the size – can provide that needed safety net. This entry was posted in Tiny Living and tagged camping, comparison, rv, tiny house, trailer. You forgot about cancerous fumes in the campers due to the overuse of plastics and foams, that are less present in the small homes. Hey that is exactly what I was going to say! Not everyone is in this to be “green.” Some people want tiny homes for health reasons. I have even heard of a boy with (downs syndrome, I think), where the tiny home was used as therapy for him. That is until the stupid Homeowner’s Association where they live made them tow it away… Anyway, my point is that are MANY reasons that this is a good choice. Re-purposed and recycled wood is low in harmful off-gassing that makes some people sick. I know. I lived in a brand new trailer that the fumes were horrible and made me sick. It depends on what kinds of materials are used in the small home. It can have just as much outgassing as a camper. Also, there is no such thing as cancerous fumes. The correct term is carcinogenic. I would like to know where you got your information. I suspect you just made it up. This is a good article; both practical and simply stated. Any person looking at the pros and cons of either/or has a good take off point from here for further delving. Thanks! You forgot to add that most RVs are ugly, especially the ubiquitous ones we see in nearly everyone’s backyard, gathering algae and dead leaves. They’re nearly impossible to recycle, perhaps only the metal in one is worth anything and tearing one apart would be a nightmare of plastic and pink insulation. On the other hand, a tiny house is CUTE! People really notice them and want to know more, you could use it as a playhouse, it would probably add to the appearance of your back yard, and most if not all of it should be recyclable. The Tumbleweed Houses while wonderfully designed, cost as much as my first 2 bedroom house (which included land 🙂 . I want a tiny house that can be built for under 5K, and done well. I’ve lived in a rv full time for almost 7years. Going south in the winter n north in the summer. A tiny rv house would solve many difficult rv problems. Like your post. Frankly I detect a wee bit of “we’re better than those people over there” competition. The relevant categories are: a) Living spaces on conventional foundations, b) living spaces on wheels that otherwise resemble those on foundations, and c) living spaces on wheels that more closely resemble automobiles and trucks than conventional houses. Then there’s the question of size, that conventionally correlates larger size with higher “status” (silly concept, that), but in the microhouse universe the relationship is reversed: we are more impressed with designs that do more with lower square footage. To my mind two of the critical variables are a) embodied energy in the structure over its designed lifespan; and b) energy and resource throughput of the occupants’ lifestyle. Clearly, less is more, (less resource-intensiveness is more desirable), and there’s wide latitude as to how to achieve that. Though, one can’t “cheat” such as by cutting corners on safety & health: nature doesn’t care about our aesthetic preferences. An unsafe stairway or a toilet without means of washing hands, kitchen burners near flammable materials, electrical outlets near water, etc. etc., might be camouflaged by clever decoration, but on the scale of a large enough number of people living thusly, will produce consequences that in turn produce a regulatory backlash of large magnitude. This is true regardless of whether one’s home is on a foundation or on wheels, or the materials from which it is built. Attention to maintenance is critical regardless of whether the exterior of your home is wood or aluminum. This cuts both ways: a well-maintained camper becomes a classic; a poorly-maintained microhouse becomes a shack. In an era of unaffordable conventional homes and the urgent need for more affordable and sustainable alternatives, it’s important for everyone involved in either alternative to “set an example” rather than “be made an example of.” One of the elements of this, is solidarity among everyone who lives in something other than a conventional large house. There is already a very large “RV dwellers” community; we would be crazy to not join forces with them to seek municipal and other regulations, and financial options, that are favorable to both. Consider remodeling conventional campers to include some of the best features of self-built microhouses. And, consider including some of the best features of conventional campers in self-built microhouses. Imagine the possibilities for “hybrid” homes that embody aspects of both types. I agree 100% with G…I came across these comments as I’m RESEARCHING tiny homes and converting my travel trailer into a tiny home….I am doin my homework before jumping in with both feet…so with that being said and the research I have done this far, I accept that challenge G,a little of both worlds makes a unique hybrid! Stayed tuned…. – Is the Aluminum frame of a trailer better than the wooden frame of a tiny house? – Is there a stormproof trailer which can be anchored just like a tiny house? Another thought I just had – weight seems to be a factor. Any suggestions from anyone on how to build a ‘tumbleweed’ style house but to make it as light as possible for (hopefully rare) towing purposes? Investigate the use of paulownia lumber in construction. I read it is as strong as oak, but 1/3 the weight. It is my opinion that if someone does their own construction they could chose any number of ways to build that might end up looking more like a travel trailer or more like a “tiny house”. The actual internal features could vary in either direction for both types of appearance. There is no fundamental reason that a travel trailer couldn’t be built with thicker walls and better insulation. A tiny house could be built using aluminum travel trailer type siding to help reduce weight. I have read of people that install composting toilets in travel trailers. I think that the distinction between a travel trailer and a tiny house on wheels really boils down mostly to a matter of perception based on the appearance. Cost is certainly important, at least for some of us! A camper trailer, with appliances, ready to go, can often be had for as much or even LESS than just the utility trailer that you would have to buy to build a tiny mobile house on!!! I know I’m a little late to this party, but I wanted to point out to Dawn that many rural areas in the US have little or no zoning or requirements for building with the possible exception of a percolation test. That way you can built a small but not mobile house of any design you want. You will have property taxes however [which can be very reasonable out in the boonies] but no one will be able to steal your house. Alternatively, the floor plans of travel trailers are ripe for the picking. I”m surprised I dont see more “borrowing” of travel trailer floor plans in tiny homes. All single level living (no ladders! ), multi-functional furniture (the dinette/bed), small appliances, ingenious storage built into every nook and cranny. If I’m ever lucky enough to build a small house, I will plan to incorporate many of the ideas I’ve learned from my trailer. wow. good observation on interior design. some ideas might be worthy of incorporating, tho i think the beauty of small homes comes from everything being more or less available at hand, without extra effort. As someone who has lived in a modern condo with skylights, I can attest to the difference they make; not only seeing the stars and the occasional moon shine in, but the difference in light during the gloomier months is critical for mental health and saves electricity, too. Nice passive ventilation if they open and you can get to them, too. For anyone that might be thinking about going ahead with a tiny house build, find out if you have a local ‘Rebuild’ store that recycles used building materials and check it out regularly with an eye towards what you still need; also Craigslist and your local ads; you can pick up necessary items for pennies on the dollar. You also can conceivably buy land in the boonies for small monthly payments to the owner, just needs some looking and a lawyer can draw up the paperwork for cheap. In other words, don’t let the fact that you have little money prevent you from considering getting your own land. Try driving down country roads and looking for likely properties with old, forgotten real estate signs on them and then search in the county records for the owner. That’s how I came across my property. Oftentimes the owner will be an elderly person who long ago gave up hope on selling the land but could really use a few hundred a month. My husband has been in the building industry for over a decade. One of the things they use in commercial building is metal studs for framing. I would assume they would be a somewhat hybridization of the trailer and the stick-built and would cause a Tumbleweed like home to be a lot lighter to transport but still structural. IDK about cost efficiency building with that material though. RE trailer floorplans: Yes, that’s exactly my concern. I’d still love a loft, but I would like a back bedroom too. We got a 29′ trailer for free last weekend, and it needs some work done to a wall. I’ve already had ideas before of building a trailer home to live in with our son on property we’re inheritting, but with a gambrel roof to maximize interior space. When we were initially looking at trailers last fall, I discovered early 50’s Spartanettes. Many of the floorplans are close to what I’d like. With a little tweaking, and add a gambrel roof with a loft? Perfect. Now to convice the spouse… LOL. Just have to be careful with metal studs and tiny houses on a trailers because when you tow the vibrations will eventually cause many screws to come loose. Saturday when he got home, my hubby told me that he’d liked my idea of using metal, but would probably also weld them to each other to reinforce them so they would not come apart. Since then, I’ve seen that Tortoise Shell Homes can be built with either wood or metal framing. I wonder how they handle the wind. I have been thinking about building the Tumbleweed ‘Popomo’ or something similar, but with alterations to aid in aerodynamics. My plan is to be on the move a lot however, and I’m not sure how well these tiny homes hold up to constant movement. I have heard one anecdote about screws loosening over time, but information on it is hard to come by. I don’t like the idea of an RV because I plan to be in cold weather (US zones 5-7b), but if this thing is going to fall apart on me I may have no choice. If anyone has any thoughts or experience on this I would greatly appreciate advice. First, I’ll let you know that I’m a home-grown carpenter. I’ve built and designed many buildings and things during my time, most of which are still going strong (though no longer in my possession). In answer to your question and concern about “information on it is hard to come by,” the loosening screws mentioned are those used especially in metal stud framing for homes built on trailers. A method to prevent this is to glue each screw throughout the build. Also, be aware that the metal studs at lumberyards/ centers are not structural gauge. You will need to order 18ga., or at the very least, 20ga. in order to have load-bearing studs. Safety and your longevity first! Remember also that to use metal studs, you likely will want to cut & glue thick foam insulation sheets to completely fill the wall cavities and use spray foam insulation to fill any tiny cavities afterward. Also glue your choice of sheathing to your metal stud/ insulation-filled walls before you screw the sheathing to them. This will give your walls/floors/roof the structural integrity (AND the insulation values you are wanting) it needs to survive being pulled many miles/years down the road. CAVEAT! This is not the entire story, but a major part of it. Please consult any of the good books on DIY construction available before attempting your own build. (You know, the good old CYA part.) I wish you well. Another option is to build a parking bay for the trailer, a sort of garage which serves as a “slip cover” to protect it from extremes of heat and cold…. and damaging winds. A loft can be added above the trailer space. trailer also, so the added clearance may not be as important to you. A custom tiny house has the advantage that the entire structure can be welded steel, making it bear-proof, more rot-resistant, at least for much longer, able to survive higher winds, deeper snow on the roof, and better able to survive a traffic mishap. I have plans available cheap. Also, better utilization of space, and more storage. would be nice to add skoolies into the comparison mix, as they also have advantages and disadvantages compared to both of these options. They are safer than both on the road, as a school bus is built like a tank, and you don’t need to worry about tow capacity of your vehicle since it has its own engine built in. Good schoolbuses can be had for the price of a good trailer also. We went the bus route for these reasons. Of-course the builtin engine can also be a negative if it breaks down….. Both tiny houses and camping trailers have bathrooms most of the time.